Ahead of tomorrow's EU summit, French President François Hollande has decided to give a lengthy interview to several European dailies (including the Guardian, Italy's La Stampa, Spain's El País and Germany's Süddeutsche Zeitung). The full interview - the first major foreign interview since Hollande was elected last May - is due to appear in tomorrow's print edition of these papers, but is already available on Le Monde's website. The return to growth involves mobilising funds at the European level – which is the [growth] pact we adopted [at the EU summit] in June – but also improving our competitiveness, and, finally, coordinating our economic policies. Countries running a [trade] surplus must stimulate their internal demand through salary increases and tax reductions – this is the best expression of their solidarity. We all take part in solidarity, not only the Germans! The French, the Germans, as well as all other Europeans within the framework of the European Stability Mechanism [the eurozone's permanent bailout fund]. Let’s stop thinking that there is only one country paying for all the others. This is false! Nonetheless, I know our German friends are sensitive about surveillance. He who pays has to control. He who pays has to sanction. I agree. But budgetary union must be completed by the partial mutualisation of debt: through the Eurobonds. She is outspoken, she says things…This saves time. And I have the same attitude…Indeed, we are not in the same time scale. I was elected five months ago, and the Chancellor has her elections in ten months – but this does not lead us to defer choices. The language used is certainly diplomatic, but the message to Berlin is clear. First, Germany should bear in mind that there are other countries paying for eurozone bailouts. Second, that debt pooling remains high on France's agenda. I would like a United Kingdom fully engaged in Europe, but I can’t decide for the Britons. I’ve noticed that, for the moment, they want to be rather in retreat. The Britons are bound by agreements which they signed up to. They can’t detach from them. They now at least have the merit of being clear. The eurozone, the budgetary union: they are not in them. I do not intend to force them. I’m in favour of monthly meetings of eurozone heads of state and government…This Eurozone Council will allow us to better coordinate economic policies and make, country by country, the appropriate decisions. It’s not about excluding the other countries: those who want to join the eurozone will be associated to our debates. Certain countries do not want to – it’s their choice. But why would one need them to come and tell us how to run the eurozone? France defends the idea of ‘integration with solidarity’ [intégration solidaire in French]. Every time we take a step towards [greater] solidarity, the union – that is, the respect of common rules – must progress too. This is not new, but a clear indication that France and Germany are on opposite sides with regard to whether surveillance or solidarity should come first. Really love the idea of putting the democratic framework idea of until last. How exactly do you change so much and then democratically legitimize the changes later? "Elle viendra donner un cadre démocratique à ce que nous aurons réussi de l'intégration solidaire." Un cadre can also be just a "frame." So, is saving this step for last like framing a lousy painting to dress it up? Is this the French equivalent to putting lipstick on a pig? So if countries running a trade surplus need to reduce tax and raise wages, countries running trade deficits should raise taxes and reduce wages, right? I know Hollande has one of those covered, I look forward to his announcements of pay cuts to public sector workers. Hollande puts forward a good point, which is that pro-growth policies must come at the European level. While he doesn't mention much anything with regards to the member-states, it's clear that there is friction between Angela Merkel and him when it comes to the role of the ESM and maybe even the ECB in stimulating growth. Still, this very same policy of supporting growth at the European level I put forward in my recent blog post about the Sovereign Debt Crisis. Probably more lipstick on a PIIG. Well what William S said about roses is also applicable for pigs and PIIGS, they simply have that manureish smelling aftershave ('eau de merde', or something like that). The EZ countries are much too different for that. -Germany might use a little stimulus, just to get to the likley small dip. -Holland needs probably somewhat lower taxes and no rise in wages costs to rebalance the economy. 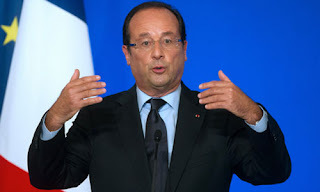 -France needs a lot of structural change and to reduce its debt substantially and restore competitiveness. -PIIGGS simply need to bottom out first and have COC and alike priced at a new but also sustainable level plus most important get much cheaper re all sorts of costs and reduce red tape enormously. Nobody will start investing with negative growth and a basically completely uncompetitive investment climate. Stimulating now is simply postponing the new start by postponing getting to a stable bottom. Also highly ineffective even with a 'normal' stimulus package you will not get these economies going again. Not even to mention who would lend them the money and that the costs of more lending would most likely be much larger than the proceeds (as your rates go through the ceiling). Simply it is a confidence problem more than a stimulus problem, the bottom has fallen out. First have to repair the bucket before you can put water in it. You can start a discussion if the confidence problem could have been prevented, but that is hardly useful as it is there and it looks there to stay for years to come. Paternalism lives! The governments are all, the individual must bend to their will. Economic rules to solidify the grip on European throats, then you all get to vote on it. LOL!! Hollande veut deux chats? Il n'a rien appris? Il a deux chattes deja, qu'est ce que ca lui donne?